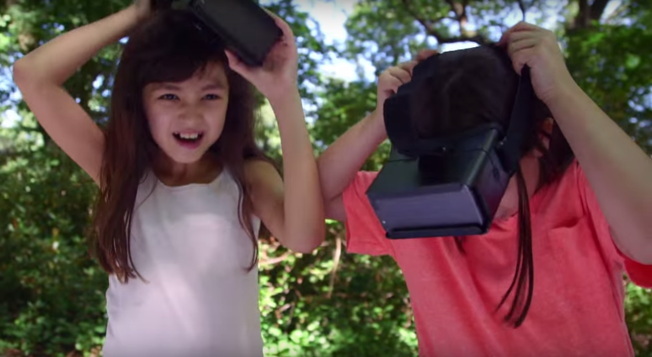 In the latest installment of the Ad Council and the U.S. Forest Service's "Discover the Forest" campaign, the Barbarian Group puts fake VR headsets on a bunch of eight and nine year-olds and promises them they can test "the most realistic video game in development." With the headsets on, the children are led into a wooded area to discover "The Forest," a game in "HD" and "Surround Sound." Upon removing the headsets they realize the forest itself is the game, more vital and alive than a billion shimmering pixels could provide. In the end, a voiceover says, "Maybe imagination isn't lost after all. Maybe it's just been playing hide-and-seek in a forest nearby." Viewers are directed to learn more at DiscoverTheForest.org. Social outreach includes Facebook, Instagram, Spotify, Twitter and YouTube, and encourages families to visit nearby forest areas with the hashtag #Naturehoods. "We tricked a bunch of kids into putting down their video games by telling them that they'd be testing an even better video game," says agency creative director Jill Applebaum. "When we finally revealed that the forest itself was the game, they weren't the least bit disappointed." It's a great idea for folks of all ages to disengage from technology and enjoy the vibrant beauty of the natural world. Still, there is something troubling about the deception. Yes, the trickery was benign, and driven by good intentions. Even so, this was probably the first personal and direct interaction these kids had with advertising. And they were lied to. What seeds are we sowing here? What's more, as we saw in that freaky Umpqua Bank commercial, one day the forest will burst up through the sidewalks, engulfing our cities. What will become of us then? !